pain symptoms before scheduling a doctor's visit. out of your coverage with the fepblue app. preventive care and so much more. Download the fepblue app to get the most out of your coverage—find a provider, contact the Nurse Line, estimate procedure costs and much more. Look up prescriptions covered by your benefit plan and find out the cost benefits of generic drugs. Browse our online directory to find Preferred providers, urgent care centers, and other facilities near you. If you’ve recently enrolled in the Service Benefit Plan, here’s everything you need to know about your new healthcare coverage. This brief walk-through will help you see some of the updated features our site has to offer. 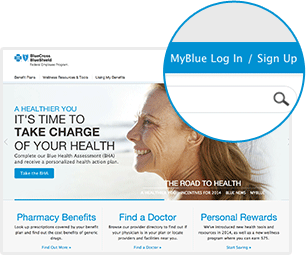 Log In to MyBlue to access your personal healthcare information. Don’t have a MyBlue account? Just click “MyBlue Sign Up” to easily create your account. Tap the menu icon in the upper left corner to open the mobile menu and navigate the site. The same helpful information as before, just in a new place. Benefit Plans: Compare, enroll and learn more about our plans. Get details on all of the great health and wellness tools available to you. Using My Benefits: Find out more about MyBlue and how to access your personal information. Log in to MyBlue to access your personal account. Don’t have a MyBlue account? You can sign up for one here to get get the most out of your plan. 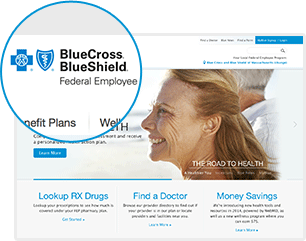 No matter where you are on the site you can always go back to the home page by clicking on the Federal Employee Program logo in the upper left of the page. Now, get started exploring and learning what fepblue.org can do for you and your family. 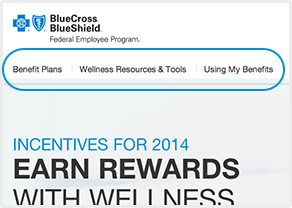 You can tap the Federal Employee Program logo to go back to the homepage at any time.